Martha Sleeper items for sale. Martha Sleeper (1910-1983) was an actress, but we remember her best as the creator of whimsical adornments from bakelite, wood and metal. 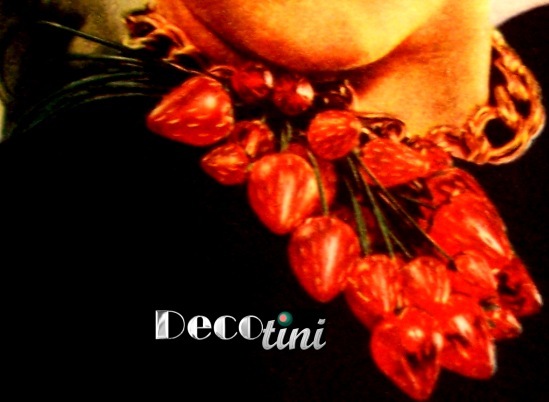 Check out the unbelievable bakelite strawberry necklace and the black crow sitting on her hat! 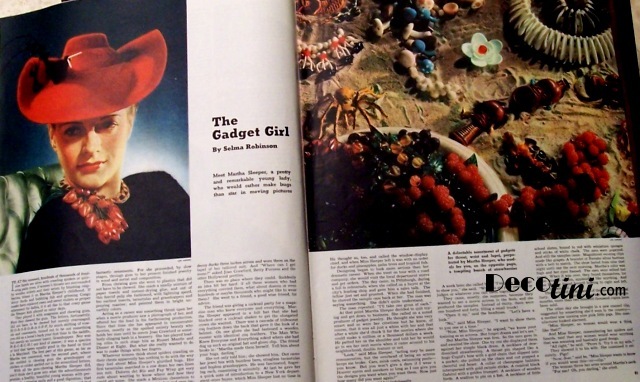 This is the opening paragraph from a 1938 magazine article about Martha, entitled The Gadget Girl. If, at this moment, hundreds of thousands of feminine lapels are alive with crawling spiders or quivering palm trees, if women's throats are surrounded by wooden nickels and their wrists by blushing raspberries, blame it on Martha Sleeper's childhood. If decoy ducks and bubbling fish and grinning Congo masks have replaced roses and sweet violets as proper adornment for ladies, it is all due to that crazy game the Sleeper kids played on rainy days. The article goes on to explain an interesting game involving anagrams and Martha molding her chewing gum into creatures. Martha's love of creating fantastic ornaments was in play long before she went into acting. Her earliest pieces, grasshoppers and spiders, were made from paper towels and glue. Her first tarantulas were arranged in a row down her own sun suit. Delores de Rio and Fay Wray saw her and demanded to know where she got them! Further reading explains a meeting Martha had with her buyer the previous year (1937) . Rather than giving them the box of jewelry to sort through, she insisted on showing her pieces one at a time. The meeting lasted 4 hours. Martha showed 140 items, all but 7 of which were selected for production. Within one year, over 200,000 copies had been sold to the public. We may never be able to positively identify all of her works (I wish an old catalog would be unearthed some day! 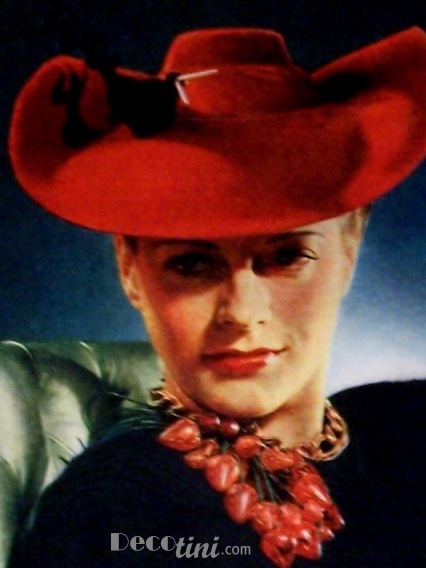 ), but the article helps shed light on some of her non-bakelite creations. There is further info regarding the details of Martha's creative journey, which any collector would enjoy reading. A copy of the complete magazine article text will be included with any purchase from this page of items.